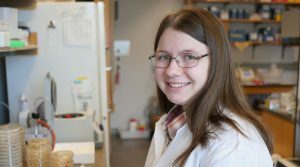 Junior Leah McKinney practiced kitchen microbiology on her ranch in Nevada before exploring the intricacies of DNA replication initiation in bacteria at MIT Biology. Leah McKinney grew up on a 50,000-acre cattle ranch in Nevada — vaccinating sheep, roping calves, digging for fossils, and occasionally hauling home old bovine femurs. She saddled horses, treated sick lambs, and helped ewes struggling to give birth. One Christmas, she even asked Santa for a fetal pig. “He delivered,” McKinney, now a junior in Course 7, recalls with a laugh. When she was 12 years old, she saved up enough birthday money to purchase a microscope. Even though she permanently dyed the kitchen sink a distinct shade of blue while making slides, her parents (who both hold degrees in animal science) didn’t mind. They even let her grow bacteria in the heater closet and tally them on the kitchen counter — all in the name of the elementary school science fair. She grew to appreciate basic science because it allowed her to study the fundamental mechanisms behind key biological processes. She arrived at MIT in 2016 determined to major in Biology, and hasn’t wavered in her decision. Although she relishes the subject matter, she initially feared the classes would be tedious and memorization-heavy. One of the things that drew McKinney to MIT was the institute’s Undergraduate Research Opportunities Program (UROP), which allows students to join labs and collaborate with faculty as early as their first year. She recalls that, while other universities touted similar opportunities, MIT placed theirs front and center. McKinney is part of Department Head Alan Grossman’s lab, which investigates the molecular mechanisms and regulation underlying basic cellular processes in bacteria. The entire group works with the rod-shaped Bacillus subtilis, but some members study horizontal gene transfer while others focus on DNA replication and gene expression. 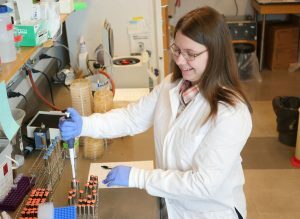 McKinney and her graduate student mentor Mary Anderson are in this second category, examining a protein called DnaA that is required to initiate DNA replication and also modulates the expression of several genes. In order to successfully grow and reproduce, a bacterium must first replicate its single chromosome before dividing into two identical daughter cells. DnaA is responsible for beginning DNA replication in all bacteria. It binds to the origin of replication on the chromosome, unwinds some of the nearby DNA, and recruits the other proteins needed to copy the chromosome. This operation is highly regulated to ensure that each daughter cell receives only a single chromosome. B. subtilis controls replication via several proteins, including YabA. When YabA binds to DnaA, it prevents replication from ever getting started. Since DnaA also serves as a transcription factor — binding to other DNA sequences called promoters to increase or decrease expression of certain genes, including its own gene dnaA — YabA may also impact DnaA’s gene targets. McKinney hopes to eventually determine exactly how. After she graduates, McKinney knows she wants to go to graduate school — likely for microbiology — but beyond that, nothing is concrete. She is sure of one thing, though: joining the Grossman lab was one of the best decisions she’s made at MIT.